You’ll find information on this page to help you arrive at the Frances C. Arrillaga Alumni Center, which is located at 326 Galvez Street, at the intersection of Campus Drive and Galvez Street. 1. Exit EL CAMINIO REAL at EMBARCADERO AVE. Turn toward the hills (away from the center of Palo Alto). 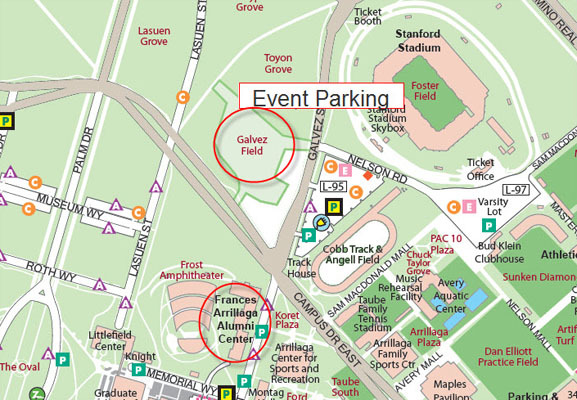 Free parking is available for all conference attendees across the street from the Frances C. Arrillaga Alumni Center at Galvez Field. Look for directional signs on Campus Drive and Galvez Street. Galvez Field is a large, dirt lot at the corner of Galvez Street and Campus Drive. If you’re staying at one of the hotels we’ve recommended, you don’t need to have a car. The conference does not provide a shuttle but there are other easy options. Find your hotel on the accommodations page for some pointers on how to get to the Alumni Center on campus. 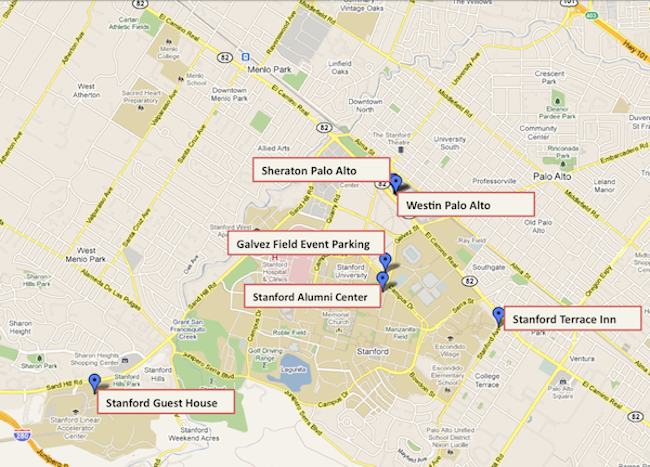 From each of the hotels, you can walk and/or take the Stanford Marguerite free shuttle. See your hotel in relation to the Alumni Center here. This map shows the main accommodations in relation to the Alumni Center and parking at Galvez Field. Click here to see the Google map and get individualized directions. This excerpt from Stanford’s searchable campus map (not great) shows a close up of the Alumni Center and Galvez Field parking area.